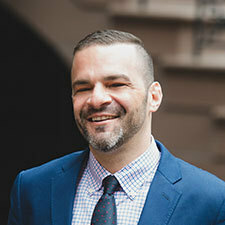 Over the past 13 years, Jason has closed well over 1,000 residential real estate transactions in Manhattan and Brooklyn. His record-breaking sales include 310 E 46th St, 104 Wooster St, 317 E 3rd St, 344 W 12th St, 56 Court St, and 212 Bennett Avenue. Jason has been featured on Selling New York, HGTV's Buying & Selling: 20 Best-Kept Secrets, The Today Show, and The Real Housewives of New York City as Countess Luann's real estate agent - he would like to state for the record "I'd never seen the show when i agreed to the taping." Jason has handled exclusive marketing and leasing including 245 W 25th St, 95 W 95th St., 340 W 17th St., 344 W 17th St., 128 W 13th St., 260-268 Elizabeth St., 1 7th Avenue South, 43 Perry St. and 6 W 127th St.
Jason co-founded the charity Jewcy.com. Over the last 13 years, Jason Saft has built an excellent reputation for creating truly innovative real estate sales campaigns through his unparalleled attention to detail. He is the creator of “Staged To Sell,” a 30-point action plan that he applies to all properties he exclusively represents. He is known for his abilities to repeatedly break sales records, reintroduce properties that other agents and independent sellers were unable to close, and deliver dramatic property transformations. He is a believer that real estate agents must invest their time, energy, and financial resources to their properties and clients. A DIY enthusiast, he is a go-to expert on FSBO (For Sale By Owner) transactions and has been featured in US News World & Report, DNA Info, and 6 Sq. Ft. For those who elect to work with an agent, he is an invaluable resource. His talent for design, staging, and decluttering—focused on price optimization—has been recognized by The New York Times and Forbes Magazine. Jason has an innate ability to transform a space from what it is, to what it should be, in order to achieve the highest return for his sellers and to help his buyers understand value and opportunity. His strategic marketing campaigns combine an extensive knowledge of development, preservation, historical trends, closed sales data and comparables, meshed with design and photography, in order to offer an arsenal of cost-effective solutions. In short, Jason exemplifies modern brokerage. 150 Charles Street, developed by the Witkoff Group, is the trophy property of the West Village. In crafting this 91 unit, white glove, luxury building, CookFOX architects designed just 10 maisonette townhouses - allowing a select group of purchasers to enjoy the privacy and space of townhouse living while benefiting from the convenience of the larger building. Maisonette 8 provides a rare opportunity: everything you know and love about a townhouse with the management and service of an esteemed condominium. 33 story, full-service, doorman/elevator building centrally located one block off Central Park. Many apartments above the 16th floor with eastern exposure have direct Central Park views. The North facing apartments have open views of the Hudson, to New Jersey and past the George Washington Bridge. All apartments have been renovated recently and there are several design schemes and options in finishes. Many apartments have walk in closets, pantries and dining areas. All apartments have walls of windows and built in air conditioning. 95 West 95 is a pet friendly building and a great value for those looking to be centrally located: one block to Central Park, Whole Foods, Home Goods, B&C subway lines at West 96th St., 3 blocks from the 1, 2, 3 train at 96th and Broadway.